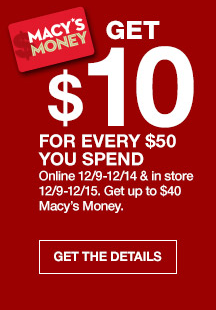 The Macy’s One Day Sale is back and better than ever with the holiday deals of the day. The Macy’s One Day sale technically starts on Saturday, December 10, but you can begin to take advantage of all the great deals on Friday, December 9. And to top if ALL off, get free shipping when you spend just $25 or more! We may not see deals like these again before Christmas, so stock up while you can.